Never tell people how to do things. Tell them what to do and they will surprise you with their ingenuity. This quote comes from General George S. Patton, a person whom you would expect to have been one of the biggest micromanagers in the world. He knew something that every small business owner should know: good leaders don’t need to control every aspect of their busy days. They provide their teams with the tools needed to do their jobs well. Then they rely on trust. After investing massive amounts of time and money in your business, it’s natural to try avoiding risk by running a tight ship. Hopefully, this article will help teach you why and how to loosen your grip for the sake of your employees, your customers, and yourself. If you don’t like people telling you what to do and how to do it, then it’s a fair bet that the people who touch your business feel the same way. Ask yourself some important questions to gain new perspectives on how micromanagement affects the individuals that you work with every day. Do you have time to do everyone’s job? You might be the rare business owner who knows how to do every task better than the people who work for you. Even if you work around the clock, seven days a week, however, you can’t do all jobs yourself. For one thing, a lack of sleep seldom produces excellence, and it certainly doesn’t make life worth living. Effective time management can only take productivity so far. If you want your business to survive over the long term, get some enjoyment out of life while producing top-quality products or services. Then, devote your time to the things that you do best, and delegate everything else. Do you want the people you’ve hired to stick around? Think back to your earlier employment experiences. Did you ever face criticism for a well-done job because you did it differently than your boss would have done? Maybe you added an extra quality check during production. Perhaps you took an extra ten seconds during a delivery to make the customer smile. If you achieved the desired results, then what did it matter? Just as important, how happy did you feel when you quit the job at the first opportunity? Employees don’t stay long when they believe that you don’t trust them. In fact, these days, it’s easy for them to find a new job that will make them feel valued, and you have to work hard to attract new ones. Constant critiquing affects their productivity, creativity, and feelings of self-worth. 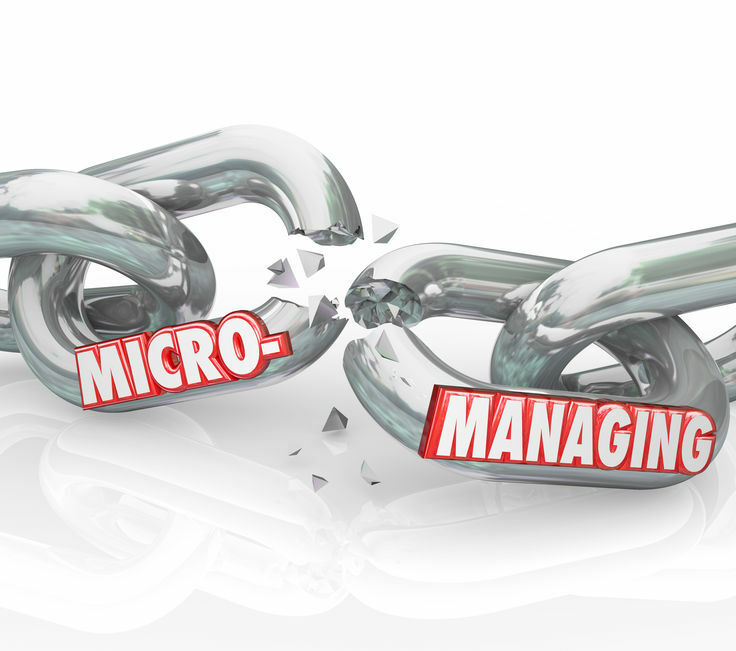 A micromanaged team won’t help you make or save money through innovation. If you want them to stay, then don’t over-supervise. Do you believe that customers need bosses? As a customer, you certainly don’t want vendors to tell you what to do. It can be extremely grating when a vendor pushes hard to sell you a wood door when you asked for a steel one. On the other hand, a vendor’s forewarning about the extra maintenance needed to prevent rust is information worth knowing. Telling customers what to do or buy is a great way to lose them. You know your products and services, but they know what they want. Your job is to bridge the gap between your knowledge and their wants. Guide them toward the right decision, but never pressure them into it. Clearly communicate your desired result: If you’re not a strong communicator, then make communication your first priority. Make sure that you supply appropriate detail until your needs no longer require mind-reading. If your expectations are complex, then write them down. But please stop short of telling them how to accomplish your goal unless they ask. Be available: This is more than just maintaining an open-door policy. If your previous critical behaviors have made you unapproachable, then no one will walk through that door. You can change the atmosphere over time. Start by focusing on praise more than criticism. Offer advice rather than edicts. Ask for suggestions. Spend your time on the things that you do best: You started your business because you excel at certain things. Focus on developing good relationships with people inside and outside of your company. Work on developing new product ideas. You’ll have less time to micromanage every detail. Ease your concerns with good quality control: Quality concerns are a major source of micromanagement. Maybe you don’t want your custom-designed software to go TILT in the customer’s hands. Perhaps you worry about consistent quality of every widget that you produce. Good testing systems will help you to sleep at night. As a side benefit, you can sneak a peek at test results without anyone seeing you do it. None of this advice means that you can never have your say. Show trust and respect, make sure that people know your goals, and then step back. In time, you will learn that you can still retain control over the outcome without directing the entire process. You have good people watching your back. You have discovered that the chains that used to bind you to them only hinder progress. You can be the boss who gets to go home at a reasonable time each evening. Heck, you might even take an occasional restful trip to the Bahamas — ideally without taking your smart phone to the beach.